Meghan, Duchess of Sussex changed for a reception hosted by the Governor-General at Sydney’s Admiralty House, following a day of busy activity which included a trip to Taronga Zoo and watching a rehearsal of Spirit 2018 by the Bangarra Dance Theatre on Wednesday (October 16). Opting to honour Princess Diana once again wearing her delicate butterfly earrings and a gold bangle, the Duchess changed into a khaki green dress from Brandon Maxwell’s Spring 2019 collection. 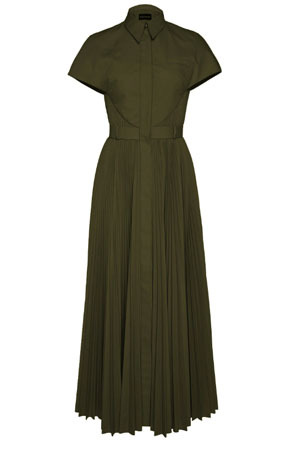 Informed by a chic fifties-inspired silhouette, this pleated shirt dress redefines chic day dressing. Brandon Maxwell is known for his love of bold colours, just look at any of his collections following the mostly black Fall 2016 collection, but I wasn’t surprised that this look was toned down in this green hue. Dior pumps completed her look. 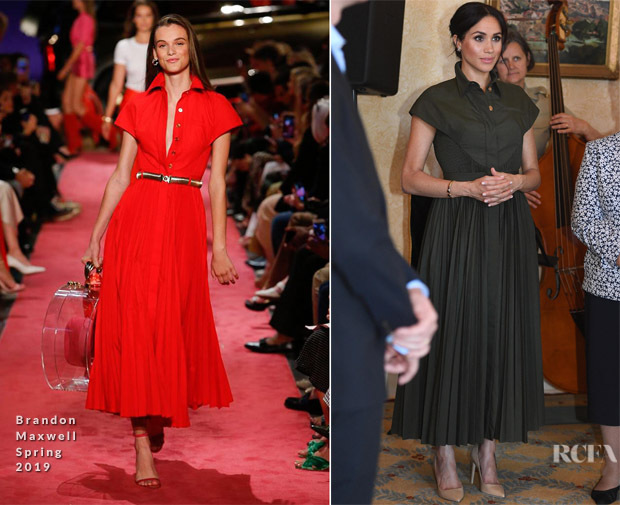 If you are wondering, why this sudden upturn in stylish options during this tour which is barely 24 hours old, that because her best friend and stylist Jessica Mulroney has joined the couple on this tour, as it has been reported that the Duchess will be making approximately three outfit changes a day.